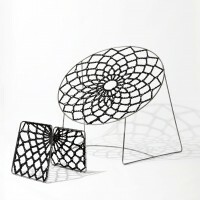 David brought my attention to a post on Contemportist about a new chair design. A chair is impossible to judge from looks but what I see makes me want to try it out. Imagine relaxing out on the patio, in the warm sunshine catching a few rays and reading a good book - while lounging in this chair. Nice. 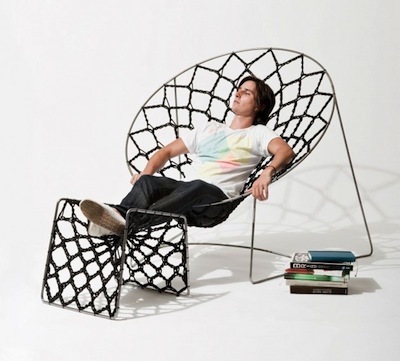 This chair is design by Henry Sgourakis from Australia. I see a strong design similarity of the pattern to the main wheel in Radiance, a kinetic sculpture created by David. The interesting part of both the chair and sculpture is that the pattern is fascinating alone, for the chair- without its function, and for the sculpture - without its motion. Intrigued by the motion? 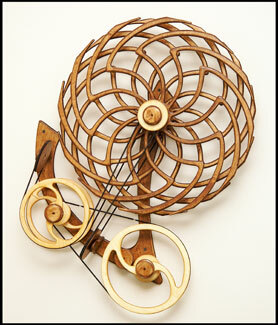 Check out other kinetic sculptures at Wood That Works.